Happy almost New Years, everyone! Many of us use this time of the year for reflection, for looking back at the previous 12 months as well as looking forward. Since I'm not at the studio during this Christmas break and have no new artwork to show you, I thought I'd share my 10 stamping-related "thank you's" instead. So here they are, in no particular order! 1) My new studio. 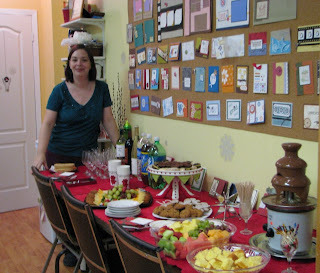 I do so love having a wonderful space to work with and share with my class/Club attendees. While it's smaller then the old place in terms of classroom space, I just love it to bits. 2) My fellow demonstrators: Whether its my amazing "Canadians, INK!" team members or all the fabulous demo friends I've made over the years, I am in awe of your talent, your generosity of spirit and overall fabulousness. THANK YOU! 4) Baroque Motifs/Lovely As a Tree. Don't know what I would do with out these two sets -- they rank as my top 2 stamp sets EVER. 5) My Big Shot! I had completely resisted getting into any die-cutting machines for years now, but when SU partnered with Sizzix I knew it was time. OMG -- how did I ever live with out (and my Top Note die) before? I can't wait to see what new and exciting dies will come out in 2009. 7) SU's 48 Colour system + the new In Colors: I'm kind of hopeless when it comes to colour matching, so I love that SU has done the hard work for me. Helps me look much smarter and more artistically brilliant than I really am. 8) My family. This *is* stamping-related, because they work so hard with me to help me build my business the way I've dreamed of. From Brent's tireless support (plus helping at the shows and even stepping in to faciliate a Stampers Club night when I was sick) to my two wonderful children who keep encouraging me to work towards THEIR next cruise (hahahaha) -- they're the best. 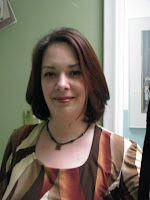 9) My Blog readers, you didn't think I'd forget you, did you?? 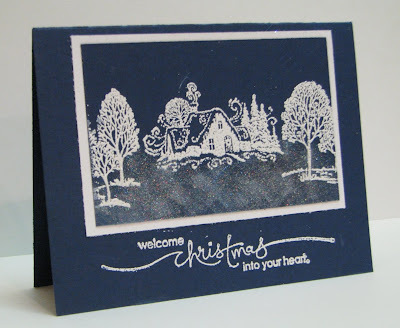 You make sharing my passion for stamping so much fun, and I love reading your comments! 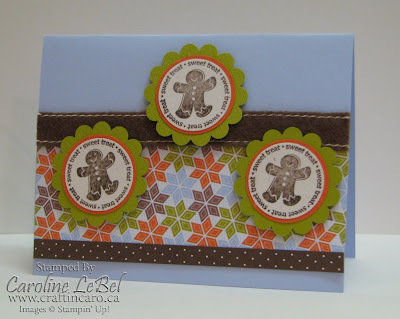 10) Stampin' Up! I couldn't dream up a better company to work along side. My life had completely changed for the better in the past 6.5 years, and I'm so happy to be affiliated with this industry leader. Just wait until you guys try my new flavours from Van Houtte: Creme Brulée, Creme Caramel, Pecan Praline and Spicy Mayan Chocolate - LOL! This is me wishing you all the love, joy and happiness this holiday season has to offer. 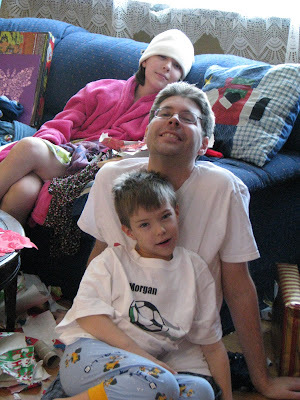 No picture from me (since I'm always the one behind the camera) but here's a little Christmas cheer from the rest of the Kobayashi-LeBel family, taken shortly after the aftermath of presents opening this morning. And I don't mean what's falling outside right now, since that's just rain (humph!). Here's a shout out to Kelly and her lovely card that I received in today's mail. What a wonderful way to start my holidays off -- many thanks! 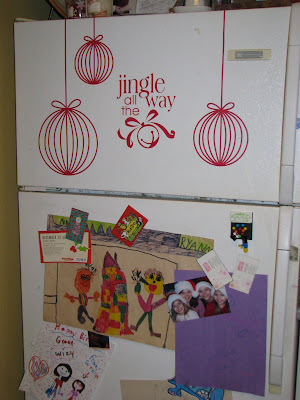 If you can ignore the rest of the mess on my fridge, I wanted to share a way I used the holiday Décor Elements to add some festive cheer to my kitchen. My kids love them! And finally, here's my Mister Morgan wishing you all a Merry Christmas. 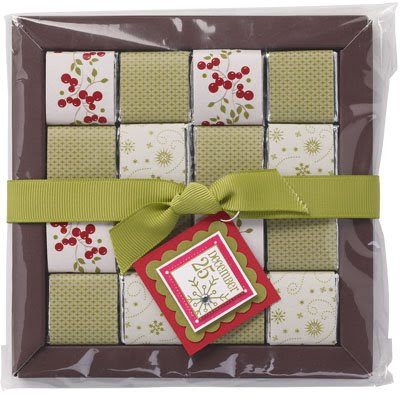 Day 49 - "Holiday Chocolates"
Surprise a friend or coworker with a Christmas treat dressed up in cheer-filled patterns and prints from our seasonal Simply Scrappin’ kits or Designer Series paper. It’ll help set the mood for the most wonderful time of the year! Day 48 - Laurie's "Sleigh Bells Ring" + 24 hours left! 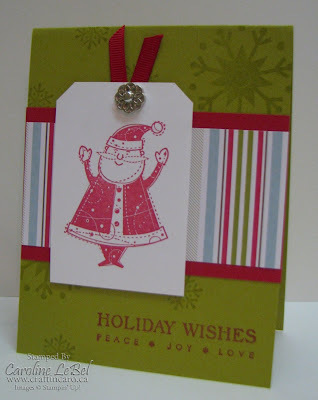 Wow, it's hard to believe that my 50 days of Holiday Extravaganza ideas is almost at an end! I've had so much fun sharing with you the past few weeks, I'm kind of sad it's nearly over with. 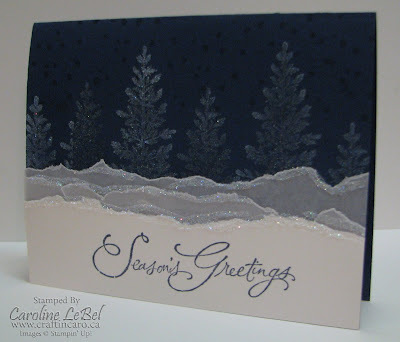 Today's gorgeous card is from my friend and downline Laurie. She's one of those stampers that I want to grow up tobecome, she's SOOOO good! You might remember her from the amazing window card she made me a while back. Laurie, you rock! And your mom makes wicked butter tarts, too. 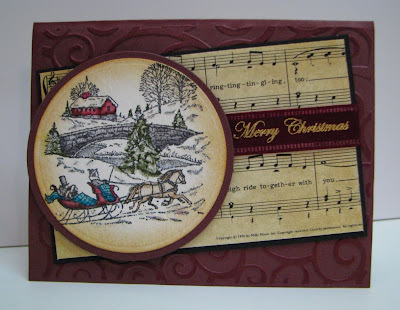 "Sleigh Bells Ring" is just one of the stamp sets on the Retiring List, so be sure to take advantage of Stampin' Up! 's 10% off retiring sets special and the free S&H. Those specials BOTH finish tomorrow, Tuesday December 23rd -- so grab yourself a cup of something warm and cuddle in with your catalogue to see what you can't live without! 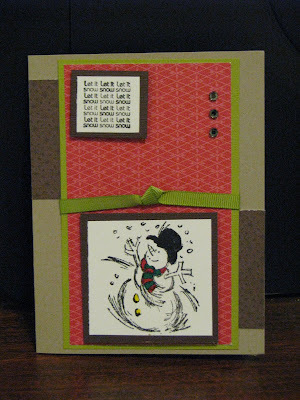 Day 47 - Snowpants, Holiday card and music! Yesterday, for the first time in about 25 years, I wore a pair of snowpants. The ridiculously cold weather and the urgings of my daughter prompted me to buy my very own pair to wear on the freezing, windy walks to school/studio in the mornings. And so I waddled over, feeling that special "swish-swish" of my thighs rustling together. But hey! I was warm :) And I got all warm & fuzzy remembering great times playing in the snow with my brothers and friends, so I'm happy I got them (even if I looked like the Pillsbury Dough Girl). 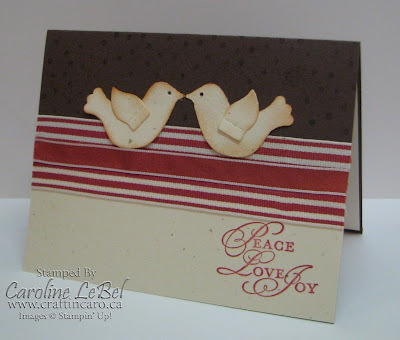 So in the spirit of waxing nostalgic, here's a gorgeous card from my friend Carolynn that uses some much-loved but retired stamps. This card began its humble beginnings after we tested out the "Top Note" die in her Cuttlebug, using an old 1/4 sheet of cardstock that had the "French Script" background stamped on it. I challenged her to make me a card using it, and so she did. 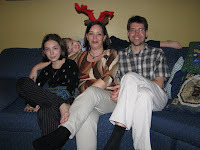 Anyhow, I hope all is well for everyone as you wrap up this last weekend before Christmas. I'm awaiting Brent's return from the store with more tape so I can finish wrapping everything up! Are you having turkey for your holiday dinner this year? Too bad this cute chef couldn't come and cook it for you, eh? :) I really loved this sparkly card from Beverly! Speaking of food, we had quite the spread this afternoon at our team party and now I JUST CAN'T STOP EATING! 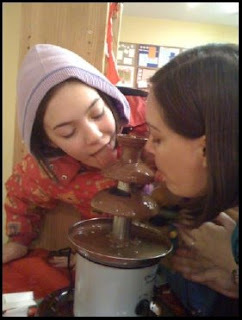 Blame the Belgian chocolate fountain... because I've dipped everything in it, including the cookies and even a piece of cheese or two (what? you all don't do that???). Or maybe I should blame it on the sparkling wine that Dina brought, on top of the Reisling and Sauvignon Blanc's already opened. There she is in her festive reindeer ears! Just wait until I show you the adorable "Season of Friendship" card she made me -- I'm going to definitely feature it at our class on January 15. Or maybe I *shouldn't* show it to you, and then everyone at the class will be wow'd by my brilliance... bwaahhahahahahaaa. Okay, I don't fool anyone. 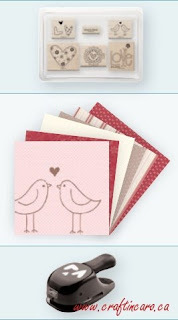 SNEAK PEEK: "Love You Much" Valentine's Bundle + Bonus Ink Pad! I'm so excited that I can officially share with you about the brand new "Love you Much" Valentine's Day bundle going on sale in just 4 days, on Tuesday December 23rd. This beautiful 6-piece set coordinates with a new 3 heart punch, and deliciously yummy new 12x12 Designer Series paper. 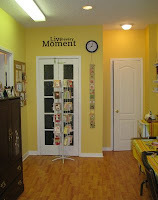 It will be featured in the new Spring/Summer 2009 Idea Book and Catalogue, but Stampin' Up! 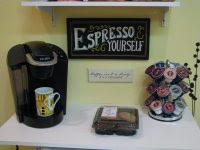 KNOWS you want to start in on your Valentine's Day projects pretty much as soon as the winter holidays are over with. Thats why they're releasing it extra early for you...at 20% off its regular price! 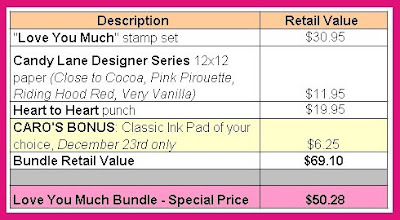 Order your bundle through me for December 23rd and get a bonus classic ink pad (colour of your choice) FREE! 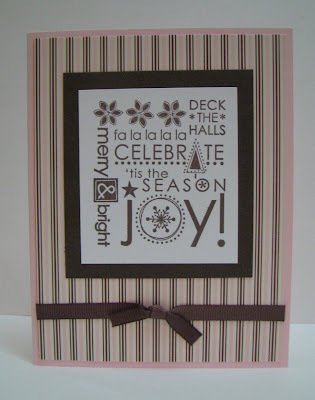 Plus, the 23rd is the final day for Stampin' Up! 's free S&H promotion, so it's the PERFECT day to order it (and whatever else suits your fancy). I'll be holding a special STAMP CAMP using this bundle on Tuesday January 27th (both at 1pm and 7pm) -- check out my Classes page to learn more! As of this morning, there are almost 100 samples up on Splitcoaststampers already using this bundle -- we demonstrators have been busy creating to help inspire you!!! The 23rd is also the final day for 10% off Retiring Stamp sets, so make yourself a list of what you need to start the 2009 Stampin' Year off with a bang! 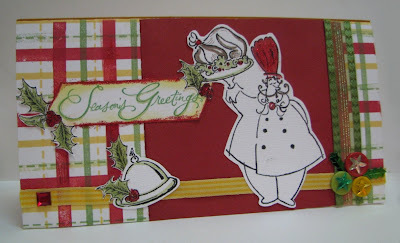 Day 45 - another holiday Stepper Box! When my blog reader Peg Foltz of Naperville, IL first saw one of the Stepper boxes posted here, she emailed me to ask for directions on how to make them herself. I was happy to provide them to her, and asked that she send me a photo of the final version when she made it. The crazy snow storm outside has had me shovelling the studio walkway twice already, and it's not even noon yet! If anyone wants to volunteer to come and do the next 2-3 shovellings, I promise to make it worth your while -- LOL! Day 44 - 2 more tree cards! I'm a little out-to-lunch today... I seem to be fighting something that has me feeling rotten, tired and cranky so I apologize for any typos ahead of time. Nonetheless, I still want to share with you the two pretty cards that came in today's mail. Many thanks to both you talented ladies for the lovely cards! Please note, I will be not be in the studio tomorrow (Friday) between 12:30 and 3pm, as I will be volunteering in Morgan's classroom for their holiday party, but will be back between 3-5pm and as well all day Saturday from 10am-5pm. Day 43: Cards, a few contest winners & a Big Shot Video! Woooweee, have I got a lot to share today!!! 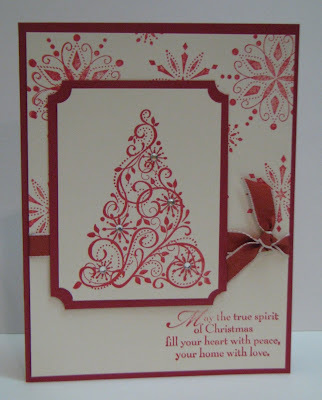 First off will be 2 beautiful holiday cards I received today -- haven't I told you I am spoiled? 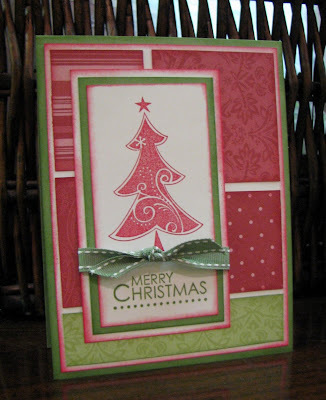 Card #1 is simply elegant, much like Winnie herself. I plan on CASE'ing this one for any last minute cards I need to make, so thanks for the inspiration! 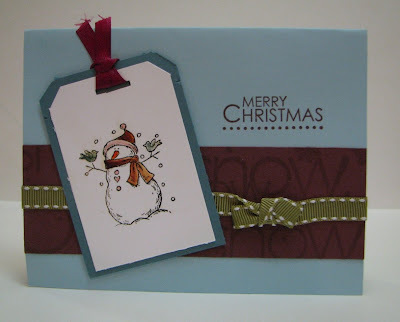 Card #2 from Chanda uses one of my favourite retired snowmen...I just love his little birdie friends. 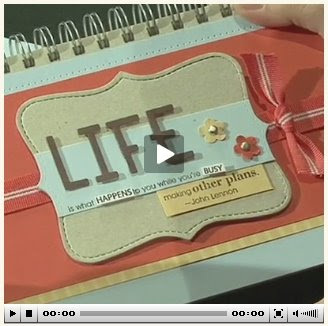 Next up is a 5 minute quickie video tutorial on using the Big Shot to create a beautifully covered Life journal, plus a cute bib and Welcome sign. If you haven't had a chance to see this machine in action, do be sure to check it out -- it even shows how to use my fave Top Note die. Not sure how I ever lived without it for my cardmaking before! I'll be starting a Big Shot Club in February...so please stay tuned for details on that. 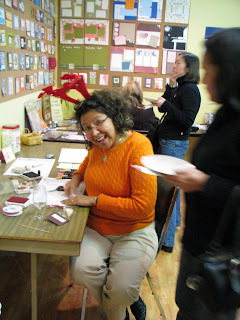 Thanks to random.org, the winner of my newsletter subscriber's Holiday Card contest is MELISSA R. (you can see her card HERE). She won a Create-A-Calendar 2009! Winner #2 was my little Breakfast Television comment give-away, and ARDYTH P-R was our random winner! She wins a Level 1 hostess set -- come and pick one when you come by next, Ardyth. Be sure to come back again tomorrow too, since I'll be posting the winners of my Holiday card contest and my Breakfast Television contest!!! I think her choice of the Rose Red and Certainly Celery combo is stunning, and the Designer prints paper just make the card extra special. Well, that and the fact that the person who made it is pretty darned special, too! 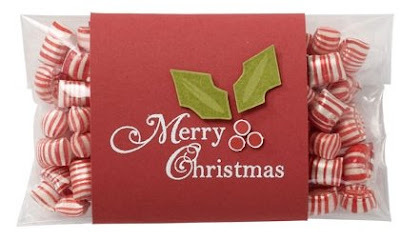 This "Merry Christmas" treat wrap is the ideal size for setting on a coworker's keyboard or passing out to friends at school; this simple, embossed holiday treat wrap makes giving small gifts an enormous pleasure! 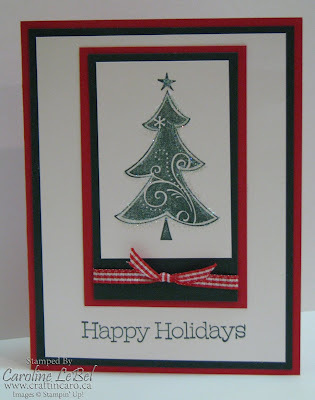 Today's holiday sample is a beautiful tag made by Diane Cooper, a very talented demonstrator on my team. I was blown away by her fabulous watercoloring job and the attention to detail used to create this tag. Isn't it fabulous? 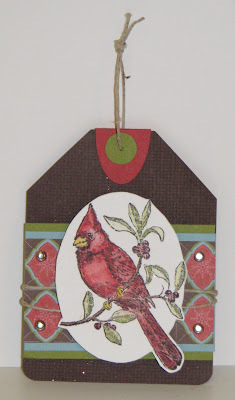 If you are unfamiliar with where the bird image comes from, it's from "A Cardinal Christmas" from the Holiday Mini catalogue, which expires January 18 2009. I seriously hope this set makes it into next fall's catalogue as I'll want to be demoing it for years to come -- I love it! 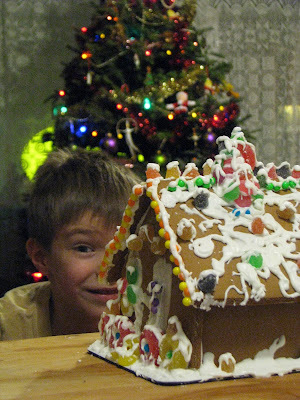 This holiday season, make a gift that your neighbors will enjoy for years to come. 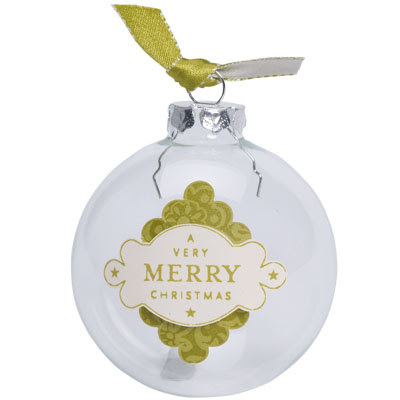 This ornament is the perfect gift to give when you're short on time but still want to spread some Christmas cheer; don't forget to make one for yourself, too! Happy Friday, everyone. Let's ignore the -18C windchill that's coming tonight, shall we? 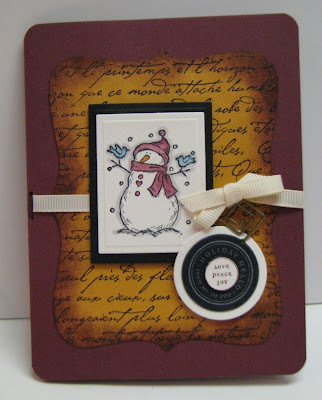 and instead cozy up to do some stamping with a big old mug of hot chocolate complete with whipped cream. You know I'm all about the decadence, right?